Decentralized trading platform AirSwap has just released an open-source tool which aggregates real-time data from existing decentralized crypto exchanges (DEX’s) within the Ethereum ecosystem. DEX aggregator apps already exist through Totle and Fetch. However, these are proprietary applications which intend to monetize their offerings in due course. 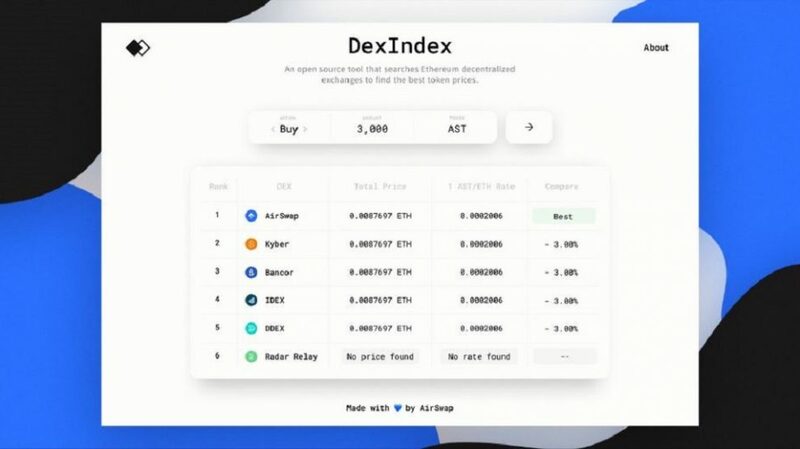 AirSwap is taking a different approach by offering the community a free, open source API which provides DEX pricing data in real time. When releasing the tool earlier today, it supported pricing data from DEX’s such as Bancor, DDEX, IDEX, Kyber, Radar Relay and naturally, AirSwap. The developers intend to add support for ForkDelta, EthFinex and UniSwap in the weeks ahead. As it’s open source, the team behind the tool are encouraging the broader community to contribute code to expand and improve the resource. AirSwap is owned by parent company, Fluidity. The Brooklyn, New York-based company was founded a little over a year ago with the backing of blockchain software technology company, Consensys. AirSwap share the decentralized cryptocurrency exchange space with the likes of Kyber, Bancor, DDEX, IDEX and Radar Relay. AirSwap is differentiating itself by being peer to peer. Unlike its competitors, it doesn’t actually use an order book. This provides it with the opportunity to circumvent malicious trading practices such as front running – where market makers act on advance information provided by their brokers and analysts before clients have been given the data. “[In partnership with Securitize] we were able to test the trading on AirSwap of a security token. That was a proof of concept that our technology is able to handle that and will be able to compliantly trade security tokens in the near future. With that near-future promise, we see that security tokens that are created and issued through the Factora side will inevitably be traded on the AirSwap ecosystem. Back in November, we flagged the emerging trend towards the use of DEX’es as opposed to centralized exchanges. Many traders distrust centralized exchanges due to the security breaches. There seems to be an acceptance that the future will include a more significant role for decentralized exchanges. Even the centralized exchanges themselves seem to be embracing this with leading exchanges such as Binance and Coinbase in the process of developing their own DEX projects. Whilst this is the future ecosystem that most traders want to see, the technology and the sector lacks maturity. Whilst security is seen to be best with the DEX model, it’s not impenetrable as a smart contract related breach at Bancor proved. More work may be required in this regard in order to convince the crypto-trading public to make the switch. For those new to crypto or new to DEX’s, the user experience can be daunting right now. Kurahashi-Sofue acknowledges that more education is required in the sector to create a better understanding amongst consumers as to how crypto and decentralized exchanges work. Hand in hand with this, he feels that AirSwap are creating a more frictionless user experience through better design.